And my fingers aren’t even all that long. An unconformity is a surface in the rock record, in the stratigraphic column, representing a time from which no rocks are preserved. It could represent a time when no rocks were formed, or a time when rocks were formed but then eroded away. The Great Unconformity (a.k.a. huge gap in the rock record) happens to exist between my beloved Vishnu Schist (metamorphic, formed by pressure) and the sedimentaryTapeats Sandstone laid down (much later) above it. For me, it’s one thing to contemplate the scale of millions and billions of years laid down in rock. It’s another entirely to contemplate millions and billions of years that AREN’T THERE. Where did they go? Were they laid down, then eroded away? Why those rocks, those years, and no others? Or were they never laid down at all? Why on earth–or, more accurately, why NOT on earth? I already want to come back in my next life as a geologist. Since this life is already too full, I think I’ll have to wait till then to fully explore those questions. Right now, I’m content just to groove. 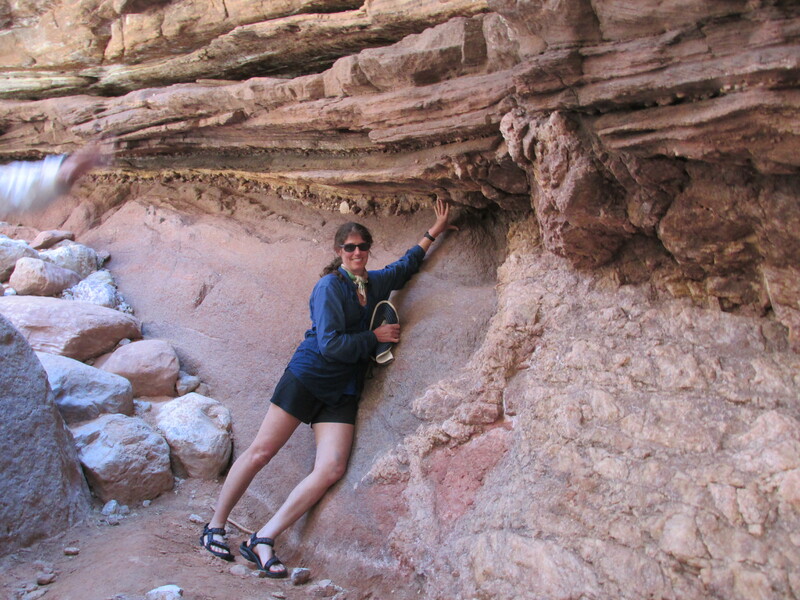 This entry was posted in Wing's Words and tagged Colorado River, desert camping, Geology, Grand Canyon, river rafting, schist happens, travel, vishnu schist by gretchenwing. Bookmark the permalink.